A landing page is the page that visitors are directed to through your inbound links. If these visitors do not have trust, they will quickly click away and you will be at risk for losing potential customers and for getting points against you in the search engines. In order to assure that you earn customers trust with a trustworthy landing page, you need to make sure specific elements are in place. The first most important thing is to make sure your inbound links complement the landing page that they direct traffic to. For example, if there is a link on your social media site that says you offer a free eBook, and the link falls on a page that has no free eBook in site, it is going to look like you are using bait and switch marketing, which is shady to say the least. This is irritating to visitors and they will quickly click off your landing page which will signal to the search engines that the page is not worth spending time on. When the search engines think your landing page(s) is not worth spending time on, they will not give it any weight and could even not rank at all in their databases. Another way that helps build trust is to keep all images, text and language consistent. An example of this would be if you have a banner ad with puppies on it, and it clicks through to the landing page, have the same image of puppies. This helps create a sense of familiarity for potential customers to gain trust. Or, if your advertisement states “Buy one get one free”, make sure that is what it says on the landing page in those exact words. Finally, make sure contact information is easy to find from any landing page on your website. If potential customers cannot find out how to contact you quickly and easily, they will feel as if you are hiding from them. Contact information can be anything from a phone number to email addresses or a contact form. Whatever you choose, make sure it is clearly highlighted and easy to for potential customers to find. 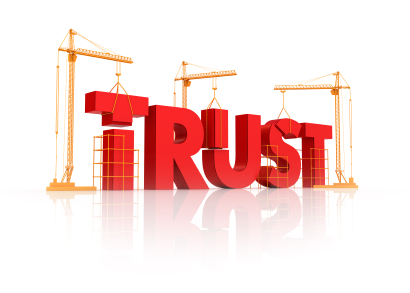 When you take the time to add trust building elements into your land pages you will notice that you will have a higher conversion rate. Many people who are used to buying online will have stories of unfortunate transactions they have made at websites and they are now more discriminating in regard to where they place their trust. When you show these people that your website is a trustworthy source of business, they are much more likely to become a valued customer.